It might come as news to you, but Tokyo has not always been the capital city of Japan. In fact, in the scale of things, it’s a relatively new capital of an ancient country that was founded way back in 660 BC. Traditionally the country’s capital was wherever the emperor called home. From 710-784, that city was Nara. The official name of the capital was Heijo-kyo, but the city was called the Capital of Nara due to its location in the Prefecture (administrative division) of Nara. Heijo-kyo was built some 1,300 years ago, and was a walled city measuring 2.7 miles from east to west, and 3.1 miles from north to south. By today’s standards the city was relatively small, but with a population in the hundreds of thousands, at the time it was considered to be Japan’s first true city. Nara Palace, which was found at the centre of Heijo-kyo, served as the emperor’s residence and housed a number of government offices and agencies. In 784, the capital was transferred to Nagaoka, where it stayed for just ten years. It then moved to Kyoto, which flourished as Japan’s capital until 1184. During this time, the Nara Palace site was used for agriculture and other purposes, but during the 20th century the area was extensively archaeologically excavated and researched. It has since been added to the list of UNESCO World Heritage Sites. When the Nara capital was abandoned the city became little more than paddy fields. Thankfully however, the majority of the temples and shrines survived in tact and retained their high status and imperial patronage. This was the basis for a new town which was built around them, known as Nanto. The temple area of the town was particularly prosperous, and this formed the basis for the modern city, which was developed in the 16th century. The Kasugayama Primeval Forest – The natural environment is an essential element of all Shinto shrines. The Kasuga Taisha temple, Nara’s most famous shrine, is served by this sacred forest, which is untouched by human intervention beyond the provision of footpaths for pilgrims and worshippers. Todaiji Temple – This grand temple is the world’s largest wooden building. Once the most powerful Buddhist temple in Japan, Todaiji now houses the country’s largest bronze Buddha. Nara Park – The majority of Nara’s main attractions can be found in Nara Park, but the park is also an attraction in itself, with free roaming wild deer that occupy the grounds. Naramachi – Take a stroll back in time through the beautifully preserved former merchant district with its long, narrow townhouses. These buildings served as shops and living quarters for local merchants in the 15th century. Yakushiji – This 7th century ancient temple complex (restored in the 1970s) contains an original three storied-pagoda and a main hall which is considered a masterpiece of Japanese Buddhist art. 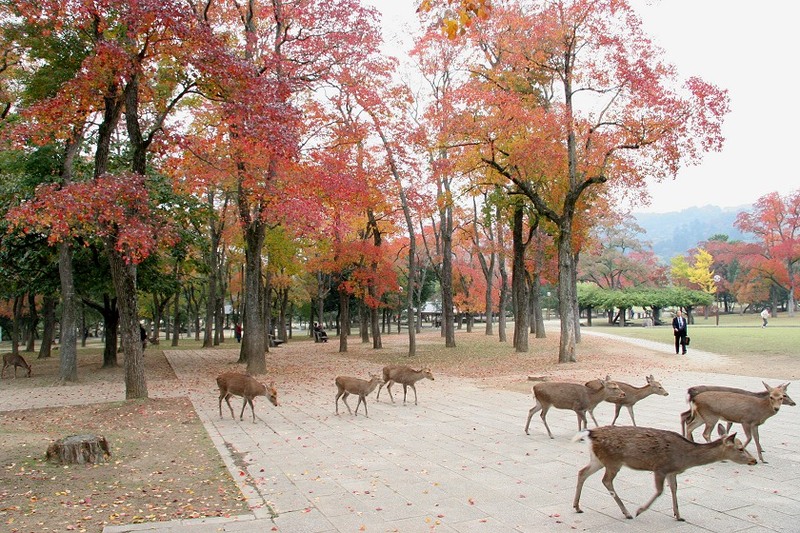 The ancient capital of Nara is one of the true wonders of Japan. Order your sushi takeaway from our delicious menu and you’ll soon see a few more!